Finding the perfect Pilates studio is kind of like dating, you want a class that is isn’t too easy, and that makes you feel like a rock star when you leave! Prenatal Pilates is a whole different ballgame, how are you supposed to keep up with the chick next to you while also staying safe (not falling off the reformer)? What does “no coning” mean? Essentially coning when you place too much stress on your newly separating 6 pack, and you feel a bulge through those muscles. I definitely didn’t want “diastasis recti” aka postpartum pooch, but aside from avoiding crunching and twisting, I was on a quest to continue my workouts safely. Each workout is different, but for me, I’ve found that throughout my pregnancy, I’ve had to modify each week, adding more pelvic stability (and less standing on the reformer) as each month progressed. A few months ago I was doing a modified plank when I reached to my belly to check for any “coning” and immediately came out of the plank because I really felt the bulge. Now each time I engage in an exercise, especially towards the end of class when I’m fatigued, I am constantly placing my hand across my belly and making sure I am engaging my core, almost as if I’m hugging my baby from the inside. 37 weeks later and I’m still moving this bump, getting an effective workout, and keeping my body safe. Yes you can still lay on your back! Just use a wedge to prop up your upper body and keep your head down. If holding your legs in tabletop makes you “cone”, place them up on the footbar for support and engage your upper body when moving your arms. First of all, you are not twisting your hips! You are simply rotating your torso using your obliques, not your shoulders. This is an effective core stabilization exercise while also toning your upper body/back. My favorite pre/post pilates snack! 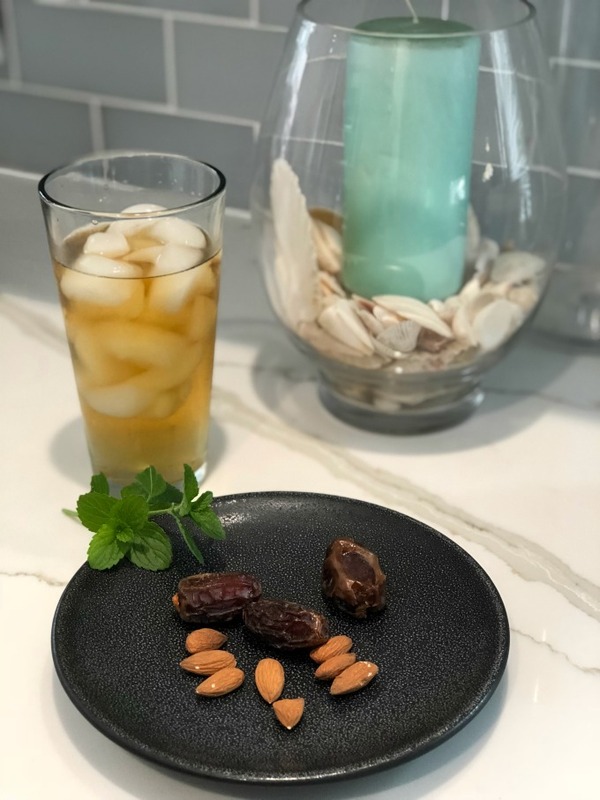 Dates and almonds are the perfect mix of digestible glucose and energy! Especially for us expecting mamas, dates are proven to ease labor and decrease rates of induction!! 6 dates a day, 4 weeks before labor has so many benefits, check out this article for more info. If you’re like me, you’re sick of drinking water. I already gave up cocktails and I’ve tried every single flavor of La Croix at this point. Try making a prego arnold palmer! 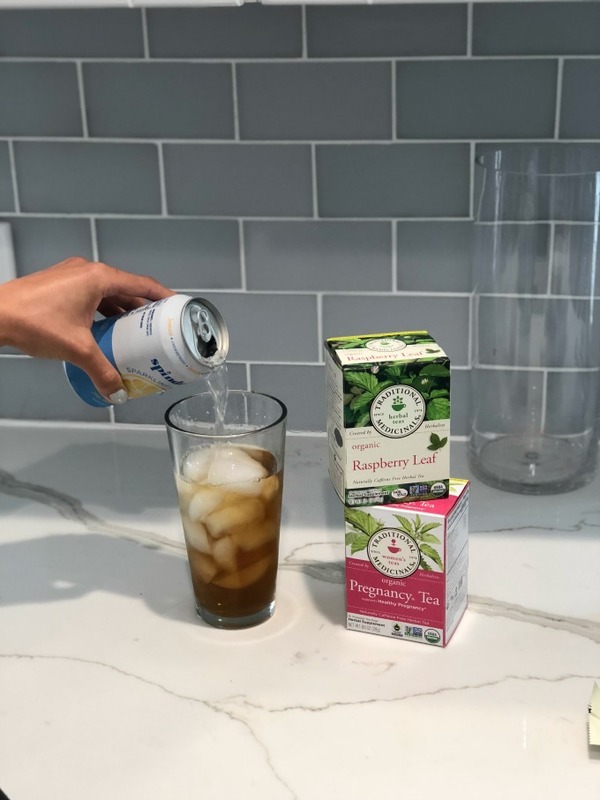 It’s so refreshing, and a great way for me to spice up my non-alcoholic drink rotation.